Need a recipe for date night? Want to impress company? 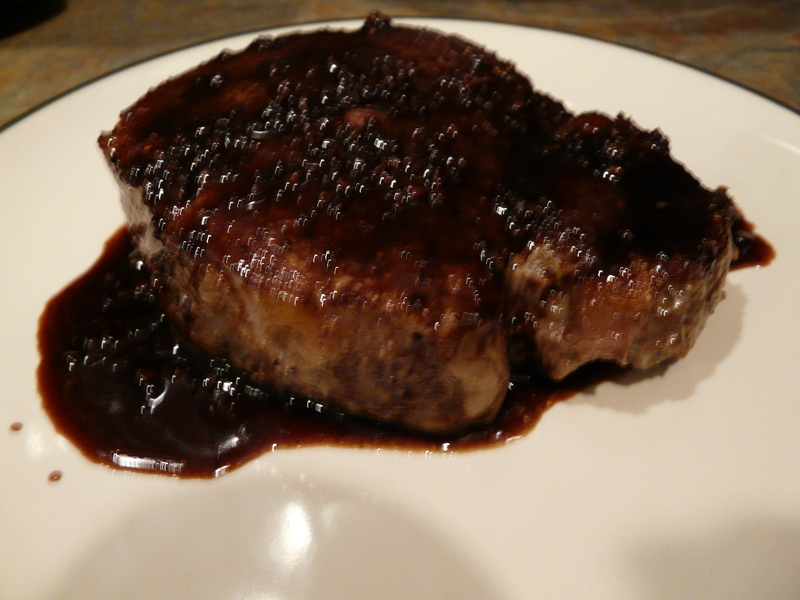 Here is a really really easy recipe for filet mignon that tastes like it was made in a restaurant. Every few weeks, I like to buy some really good steaks from the local farmer’s market. Getting a good cut of meat is important and I’ve learned from experience that you can’t always get good quality at the grocery store. A butcher or farmer’s market is definitely the way to go….even if it is a little bit more expensive. Plus, I’ll bet you’ll be surprised to see that the prices aren’t even that much more so go ahead and treat yourself once in a while. For my filet mignon, I always pan sear them and then finish them in the oven. I’ve found that this is better than trying to cook them completely in the pan. If you are not paying attention they can get burned or overdone. Searing to a nice brown color on both sides and then putting it in the oven is definitely the way to go! Also, I keep my steaks in the same pan for the whole cooking process so I don’t have as much to clean up. 🙂 If you do not have oven-safe pans then you will need to transfer the steaks to a baking pan. For the sauce, you can use any type of red wine. I usually use Chianti because that is what I like, but I’ve used other kinds if I didn’t have the Chianti on hand. This sauce tastes great with pretty much any cut of beef and I’ve used it for a variety of dishes, but my favorite to use it with is the filets. Also, you can increase or decrease the amount of brown sugar based on your preference. Sprinkle salt and pepper over both sides of steak. Allow steak to sit out at room temperature for about 10 minutes prior to cooking. Heat an oven-safe saute pan over medium heat and add olive oil. Place steaks in hot pan, and cook for 2 minutes on each side, or until nicely browned. Transfer pan to oven and heat steaks to desired doneness, checking temperature of meat every 2-3 minutes. For a medium well steak the temperature should be between 153-157 degrees F. Remember, the temperature will raise 3-5 degrees more as it rests once it is out of the oven. I remove my steaks from the oven at 157 degrees F, which usually takes about 8-10 minutes. Once steak is cooked to desired doneness remove from pan and set aside, allowing to rest. Cover loosely with foil to keep from getting too cool. To the pan add the garlic and cook over medium high heat, stirring until fragrant about 30 seconds or so. Add the red wine to pan, scraping any bits of meat that are stuck to the bottom. Add the balsamic vinegar and bring to a light boil. Simmer until sauce is reduced by about half (5-10 mins). Add brown sugar and stir until dissolved. Remove sauce from heat and whisk in 1 tbsp. butter. Taste sauce and add another tbsp. of butter, if desired. Spoon sauce over steaks and serve immediately.